Transmembrane receptors monitor changes in extracellular ATP concentration in order to detect either the uncontrolled ATP release caused by the necrosis of nearby cells or to instigate active ATP release following pathogen detection. Extracellular ATP can be perceived, therefore, as a sign of damaged self, or a damage-associated molecular pattern (DAMP). In plants, extracellular ATP is monitored by the purinergic receptor P2K1. 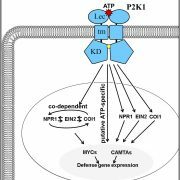 Recent studies have revealed that extracellular ATP acts as a DAMP in plants, and its signaling through P2K1 is important for mounting an effective defense response against various pathogenic microorganisms. pathogens attack plants using different strategies, to which plants respond accordingly with salicylate-based or, respectively. Interestingly, plant defenses mediated by P2K1 are effective against both biotrophic and necrotrophic pathogens with employ, respectively, jasmonate or ethylene-based defensive signaling. Jewell et al. (10.1104/pp.18.01301) have analyzed ATP-induced transcriptomes in wild-type Arabidopsis (Arabidopsis thaliana) seedlings and mutant seedlings defective in essential components in the signaling pathways of jasmonate, ethylene, and salicylate (classic defense hormones) as well as a mutant and an overexpression line of the P2K1 receptor. They report that P2K1 function is crucial for ATP-induced transcriptional changes and that a subset of genes is more responsive in the P2K1 overexpression line. More than half of the ATP-responsive genes required signaling by one or more of the defense hormone pathways, with jasmonate-based signaling being more critical than others. By contrast, the other ATP-responsive genes were unaffected by deficiencies in signaling for any of the classical defense hormones. A study of the ATP-induced genes in knockout mutants of transcription factors, demonstrated that MYC transcription factors (named after their role in myelocytomatosis in humans) acting downstream of the jasmonate receptor complex and calmodulin-binding transcription activators are nuclear transducers of P2K1-mediated extracellular ATP signaling.